Self-autonomous cars are getting increasingly popular, and it is theorized that they will replace regular cars in just a few decades. Imagine yourself sitting in your car and having an excellent breakfast while reading the newspaper, or taking a short nap in your vehicle while you reach your office. This leisure is possible only if there are self-driving cars available. The implementation of the self-autonomous technology in the automobiles industry is drawing lots of concerns in the U.S. as it will bring lots of opportunities and drawbacks. People have always implemented the latest technology to improve their economic condition, but during this process, many things go unnoticed and lead to cultural anxiety. According to the IBIS world estimates, in the U.S., there are more than 1,000,000 people employed in cab and taxi services, and other services dealing with vehicles. This means that around 7.94% of the total employed population in the U.S. will be directly affected by the introduction of this self-autonomous technology. Thus, millions of people will have to change their jobs before this technology is fully functional. These people will be directly impacted with the advent of the self-driving cars. The courier and delivery industry has millions of people employed, and they will also be affected due to this change. Vehicle technology might offer optimal behavior based on circumstances to contribute to reducing energy intake. Other traffic to the street will also benefit from traffic efficiency by minimizing congestion since the cars work to improve the efficacy of jobs. Instead of focusing on driving, passengers will be able to complete work, take a nap, and engage with interactive content as they ride to a location. This means that people will be more productive because they will have more time to engage with a given task instead of focusing on driving. These days, the cost of delivery and other related services is high only because of the people who drive and deliver. As technology begins to take over commercial driving jobs and other associated tasks, employers won’t have to pay salaries to them, and in turn, they will reduce the costs of delivery to a great extent. Reduction in the cost of delivery will eventually decrease the costs of many goods. The reduction in labor costs will thus have an enormous and positive impact on the U.S. economy as it will lead to a decrease in the cost of many goods. The short-term result will be that people will have the ability to buy more property and spend less money. 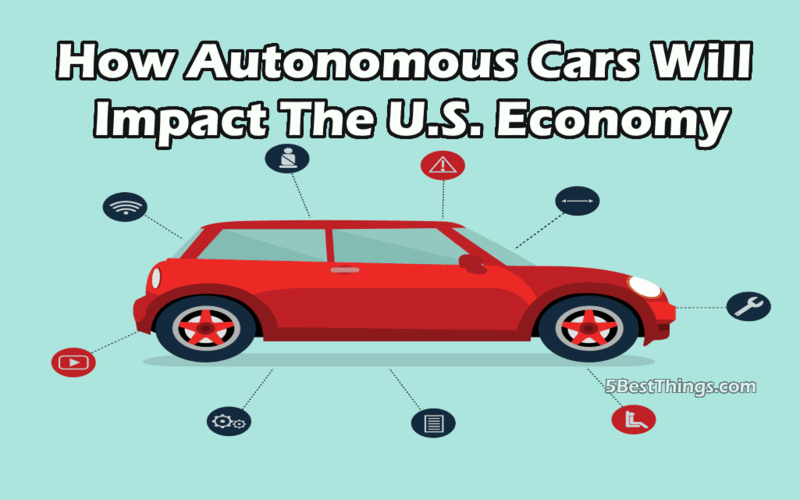 The self-autonomous vehicles will thus have a positive impact on the U.S. economy when looking at labor costs. With the convenience of self-autonomous cars, the country will see a reduction in parking lots and garages. All the major cities in the U.S. generate a big amount of revenue each year from parking fees, and that lost revenue will have a profound impact on how municipal governments can generate funds for road work and general maintenance. In the place of traditional cars will be autonomous vehicles that can drop their occupants off at a given destination and either return to a particular destination or continue to a different area. There will not be the need to park a car, and thus there will be no need of large parking sites. When there is less demand for parking, the area of the parking lots can and will be used for the construction of new buildings or offices. Traffic jams are mostly caused by human error and inefficiency, and when there are no human drivers, the chances of mistakes on the roads will reduce to a great extent. The self-driving cars will be the best way to reduce accidents, traffic jams, and congestion on the road. These cars will bring time-saving opportunities for people, and the traffic flow will improve a lot due to all these factors. The efficiency of traffic depends on each individual vehicle on the road, and traffic jams always affect their performance. Traffic jams result in the waste of time and fuel, and the self-driving cars will eliminate all these hassles. There will thus be a very positive overall impact on the U.S. economy. Currently, unpredictable traffic patterns are having a terrible impact on the economy as they tend to waste both time and fuel. These inefficiencies will be reduced if not eliminated, and the economy will see a significant and positive change. We should not fear improvement and innovation, while industries could endanger. The costs of individual errors lead to deaths, reduced efficiencies, and increased costs through insurance and other costs. All of these aspects of driving will be reduced or eliminated, and that will improve public well being and other areas of our community. Self-driving trucks and cars could provide the advantage that other developed nations and the United States need to keep relevant. While self-driving vehicles will displace more jobs than it can make, the short-term aches are outweighed by the benefits of this technological evolution! Chris is a Digital Media Strategy Consultant in Orlando, FL who specializes in digital marketing, emerging technologies, and transportation issues.